German tosafist and liturgical poet of the twelfth century; died in Regensburg about 1175, probably at an advanced age. He was one of the oldest pupils of R. Tam, under whom he studied in his youth, and he probably attended other yeshibot. On his return from France he settled in Regensburg, probably his birthplace, where, with Isaac b. Mordecai and Moses b. Abraham, he established a rabbinical collegium. His life was spent in that city, where also lived his son Moses, a noted scholar, and his grandson Judah, a pupil of Eleazar of Worms. Ephraim was an independent character among the German Talmudists of the twelfth century. Of remarkable keenness of perception, he refused to recognize, either in the theoretical or in the practical field, any post-Talmudic authority, and often, therefore, came into conflict with his teachers and colleagues. This was the case when he tried to introduce extensive modifications of the strict Passover regulations, or when, in spite of the remonstrances of so old an authority as Eliakim b. Joseph, he permitted pictures of lions and snakes in the synagogue. Established customs and religious regulations which had been long regarded as inviolable were abrogated by Ephraim when no reason for their existence could be found in the Talmud. With even greater recklessness did he proceed in the explanation of the Talmud. Traditional interpretations, and sometimes even traditional readings, had no authority for him. He had the courage in a letter to his teacher to characterize certain parts in the benediction recited at the Habdalah, on the evening of the festivals, as "foolish verbosity"; and to criticize the customary shofar-blowing on Rosh ha-Shanah. In spite of the sharp rebuke which he elicited from R. Tam, who called him conceited and impertinent ("Sefer ha-Yashar," ed. Rosenthal, p. 148), Ephraim seems to have abated but little of his independence, as shown in his frequent differences with his former pupil and colleague Joel b. Isaac, and in his answer to R. Tam (ib. pp. 149 et seq.). In fact, he is known in halakic literature for his many propositions tending to modified interpretations of the Law, some of which prevailed in spite of general opposition. He would have achieved still greater success, no doubt, but for a violent temper which caused him on several occasions to leave the synagogue during the service in fierce anger on account of some usage not approved by him. As a liturgical poet he excels all his German and many of his French contemporaries. His language is concise but clear, graceful though forceful. His ingenious turns and facile expression often call to mind the Spanish piyyuṭim. Like them, he also wrote poems in strophic rime and verse measure, which, nevertheless, are easy and flowing. His piyyuṭim are filled with lamentations over the sufferings of Israel and with penitential reflections; twenty-eight of them have been preserved. Ephraim wrote tosafot to various treatises, some portions of which may be found in the printed tosafot as well as in other works. His commentary on Abot, which in the fifteenth century was still in existence, seems to have since been lost. Some of his responsa are found in R. Tam's "Sefer ha-Yashar" and Eliezer b. Joel's "Abi ha-'Ezri." 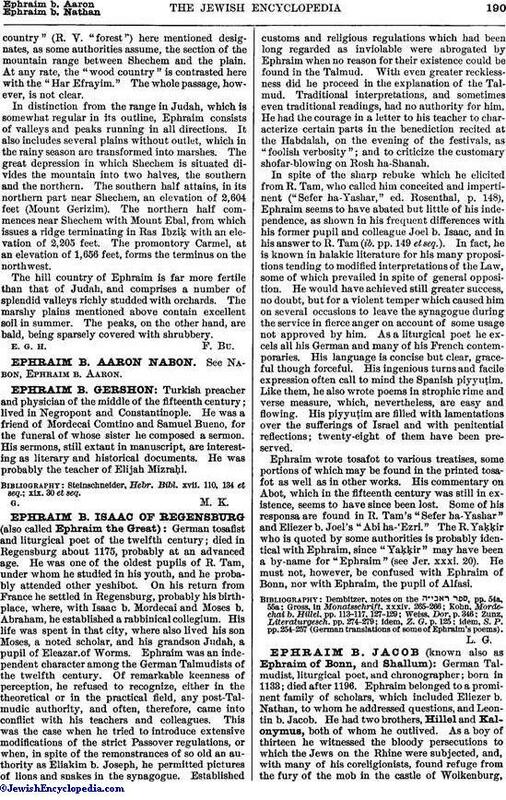 The R. Yaḳḳir who is quoted by some authorities is probably identical with Ephraim, since "Yaḳḳir" may have been a by-name for "Ephraim" (see Jer. xxxi. 20). He must not, however, be confused with Ephraim of Bonn, nor with Ephraim, the pupil of Alfasi. idem, S. P. pp. 254-257 (German translations of some of Ephraim's poems).